CEE has been working in the state of Punjab for the past 10 years. The focus of CEE's work in the state has been environment education in schools. 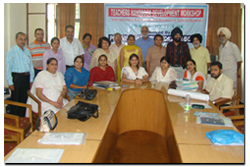 The Punjab School Education Board (PSEB), State Institute of Science Education (SISE), Punjab State Council of Science and Technology (PSCST) and 6 partner NGOs, etc are the agencies with which CEE has been working in the state. Environment Education Material: Joy of Learning publications in Punjabi as 'Sikhan Da Anand’ and ‘Karo Ate Sikho’ for std. 3 to 5 and 6 to 8. The teacher’s manuals are activity manuals providing ideas on what activities could be conducted in classrooms for transacting any environmental concepts.